In the future, society entertains the violent impulses of the masses by arranging the Hunt (or, depending on the translation, the Big Game), an elaborate international game made up of alternating Victims and Hunters who must engage in ten rounds before winning the grand prize. Advertisers pay top dollar to have the victors spout slogans over their dead conquests, while the authorities frown upon murder unless it's all in the name of good sportsmanship. The latest standoff between celebrated huntress Caroline Meredith (Andress) and Marcello (a bleach-blond Marcello Mastroianni) becomes complicated when Marcello, who's fretting over a separation from his wife, finds his attention more drawn toaffairs of the heart than the demands of the pistol. Apart from dealing with the demands of his chic mistress Olga (Blood and Roses' Martinelli), Marcello also becomes increasingly fascinated by his media-dictated arch enemy, with whom he may actually be falling in love. An unhinged chunk of satirical sci-fi kitsch that could have only been made in the 1960s, The 10th Victim is a film far more often discussed than actually seen thanks to its indelible image of star Ursula Andress (who has never looked better than here) gunning down her prey with a bullet-firing bra in New York's Masoch Club in an early sequence (later duped in Austin Powers); however, that's just the first of many delirious moments scattered throughout this very mad film. The premise of The 10th Victim will seem familiar even to those who have never heard of the film, thanks to decades of lip service paid by the likes of RoboCop, Battle Royale, The Running Man, and many others. As a satire, the story generally works and includes some hilarious concepts, beginning with Andress' early striptease in which she teasingly slaps her patrons before taking one out altogether. 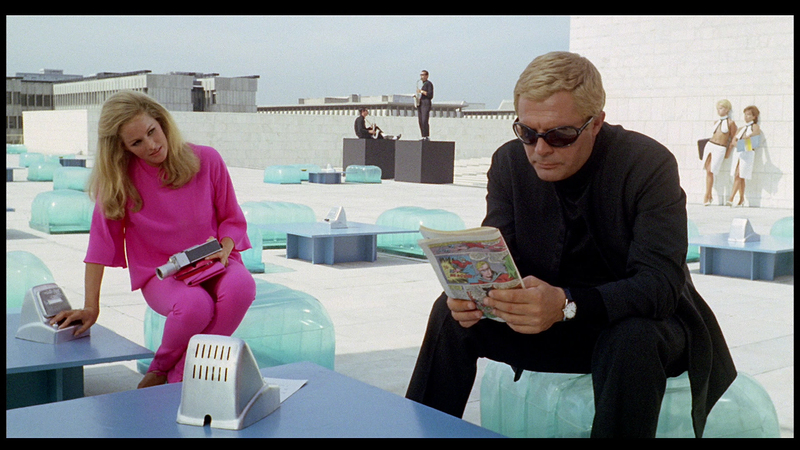 Though it doesn't quite aim for the rapturous heights of pop art delirium achieved by Camille 2000, Danger Diabolik, or The Frightened Woman, the film is nevertheless extremely appealing for its good natured eye candy tricks and hilarious retro/future shock fashions. 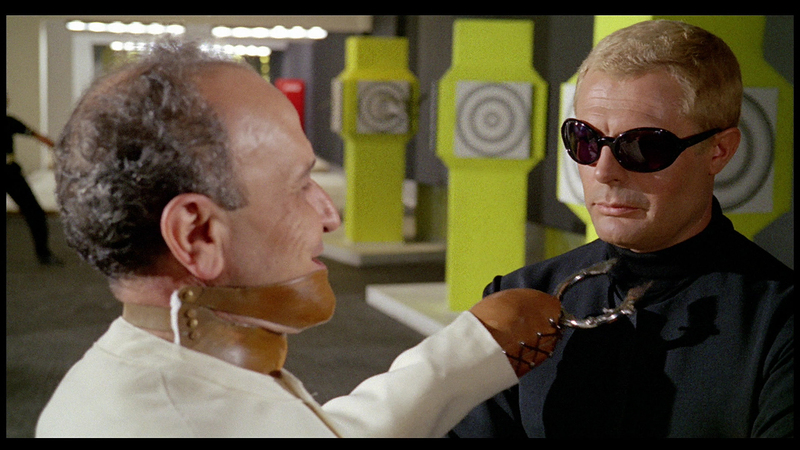 Anyone who had to suffer through Embassy's dubbed, cropped videotape edition of The 10th Victim was grateful for the Anchor Bay DVD early in the format's history, which restored Petri's quirky 1.85:1 framing. Unlike many Italian directors, Petri never showed a particular affinity for scope but still possessed a careful eye for composition, rendering pan and scan versions of his titles completely incoherent. The disc also contained the original Carlo Ponti theatrical trailer and some delicious animated menus. A decade later, Blue Underground revisited the title for a Blu-Ray release with markedly improved results. Colors are considerably stronger and closer to the pop art sensibilities of the period (check out Andress' outfits and the often blindingly yellow lighting, for one), and the entire image is much more lively and filmic than before. On the other hand, in some shots there's some light, odd grain that doesn't look completely filmic and can wreak havoc with background textures and the not terribly crisp level of detail (check out the second frame grab), but in general it's a pleasing and punchy transfer that's a hefty step up from its now-antiquated SD counterpart. As with the DVD, both the English and Italian soundtracks are included in DTS-HD mono with optional English subtitles (both an SDH version for the English dub and a different translation for the Italian track), as well as subtitles in French and Spanish. In addition to the American trailer, the disc also includes the much better-looking Italian trailer, a poster and still gallery for the film and for star Mastroianni, and best of all, the feature-length Marcello: A Sweet Life, a feature-length 2006 documentary by Mario Canale and Annarosa Morri that covers the beloved actor's life in fascinating detail; expect to hear lots about Sophia Loren and Federico Fellini, obviously, but there are lots of nice little obscure stories in here, too including archival interviews with the man himself along with Claudia Cardinale, Anouk Aimee, Ettore Scola, and many more.